Inflation is defined as a sustained increase in the general level of prices for goods and services. It is measured as an annual percentage increase. As inflation rises, every dollar you own buys a smaller percentage of a good or service. The value of a dollar does not stay constant when there is inflation. 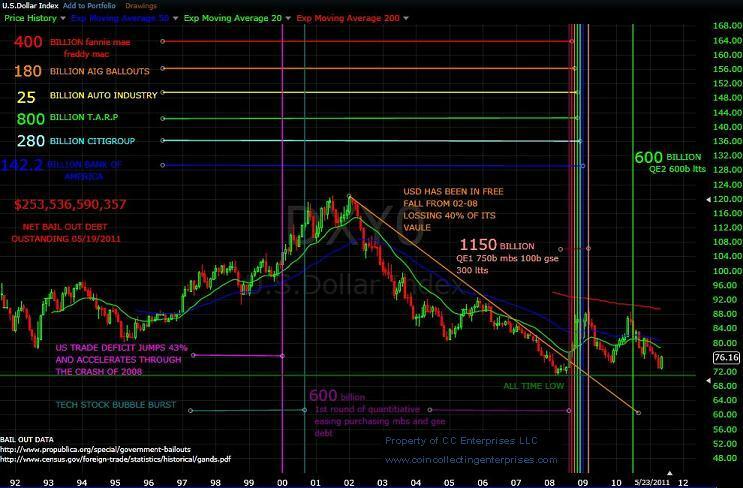 The chart on the right (click the image to enlarge it) shows what the U.S. dollar valued from 1913 to 2009. 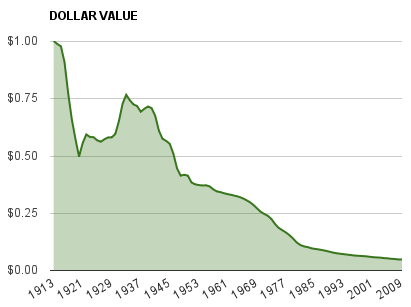 The value progressing over time is a comparison of the value of the U.S.
dollar worth compared to its original $1 worth in 1913. Meaning, as time progresses, the dollar is worth less. The dollar is observed in terms of purchasing power, which is the real, tangible goods that money can buy. When inflation goes up, there is a decline in the purchasing power of money. For example, if the inflation rate is 5% annually, then theoretically a $1 pack of gum will cost $1.05 in a year. After inflation, your dollar can’t buy the same goods it could beforehand. Why start at 1913? Simple. This is the year the private central bank known as the Federal Reserve took over the power of the money supply in the United States. Deflation is a general decline in prices, often caused by a reduction in the supply of money or credit. Deflation can be caused also by a decrease in government, personal or investment spending. The opposite of inflation, deflation has the side effect of increased unemployment since there is a lower level of demand in the economy, which can lead to an economic depression. Central Banks attempt to stop severe deflation, along with severe inflation, in an attempt to keep the excessive drop in prices to a minimum. 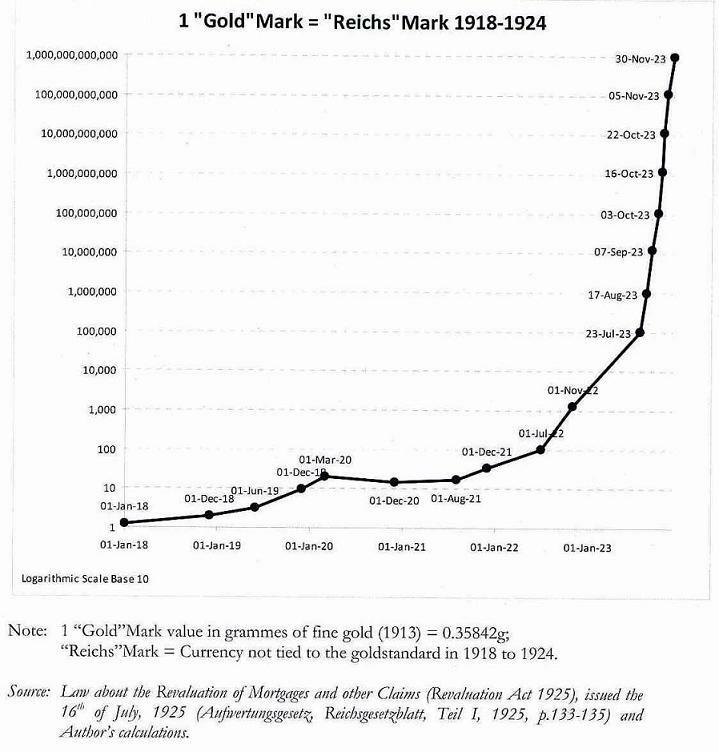 Hyperinflation is extremely rapid or ‘out of control’ inflation. There is no precise numerical definition to hyperinflation. Hyperinflation is a situation where the price increases are so out of control that the concept of inflation is meaningless. When associated with depressions, hyperinflation often occurs when there is a large increase in the money supply not supported by gross domestic product (GDP) growth, resulting in an imbalance in the supply and demand for the money. Left unchecked, this causes prices to increase as the currency loses its value. When associated with wars, hyperinflation often occurs when there is a loss of confidence in a currency’s ability to maintain its value in the aftermath. Because of this, sellers demand a risk premium to accept the currency, and they do this by raising their prices. One of the most famous examples of hyperinflation occurred in Germany between January 1922 and November 1923. By some estimates, the average price level increased by a factor of 20 billion marks, doubling every 28 hours. Click the chart to the right to enlarge it to see more details and gain greater perspective on how severe these numbers truly are. Stagflation is a condition of slow economic growth and relatively high unemployment, accompanied by a rise in prices, or inflation. This happened to a great extent during the 1970s, when world oil prices rose dramatically, fueling sharp inflation in developed countries. For these countries, including the U.S., stagnation increased the inflationary effects. To read the chart on the left and understand what the information means to the U.S. and world economy, you must first define what is being graphed. Click the chart to enlarge it. Based on the chart above, you can see the collapse of the money supply in in the money system of the late 2009 due to the banking crisis. The money supply continued to fall until the bailouts of the major banks and insurance companies. Along with the institution of Quantitative Easing, which monetized government debt, injecting liquidity into the economy. The chart above shows M3 intersecting M1 and M2 downward, showing a large contraction in lending, stifling the money multiplying effect of Fractional Reserve Banking. M1 is on pace to reach pre-recession (depression) levels by year end, aided by the massive liquidity injection by the Federal Reserve Banking System and the U.S. Treasury. the debt that is owed is always more than the money in existence. Therefore, you must have inflation of the money supply to pay the debt that is owed and the interest that is due. The bad news is, it seems we have both! We are in a situation in which M1 is growing rapidly (around 13% yr/yr), while M3 is not surpassing 3% year per year. Prices of commodities have rapidly increased since the bailout policies, while wages seem to be falling. This seems to fit the description of stagflation which we last encountered in the 1970’s and the subsequent high inflation of the 1980’s. If the age old adage, “history repeats itself” continues to be true, then it is prudent to prepare for potential high inflation rates in the near future. So what can you do? Protect your money. Whether keeping your money in currencies in the bank or at home, you are still at risk from the affects of inflation. The key solution is to look for trends in the market that money can be secured into that outpace inflation. Ideally, supply and demand principles are the most basic elements. Copper pennies are ideal as not only are you protected by the booms of the copper industry in bull markets, yet also reinforced by the fact there is a limited supply of copper pennies in existence. Copper pennies aren’t made any more, and as more are bought and pulled out of circulation, supply will decrease. At the same time, copper price must rise, even if due to inflation alone, causing more demand for copper, bringing an increase in demand. Reduced supply and increased demand means a trending higher price. This is but one example out there. Well-thought out researched logic is the key to beating inflation. As long as you stay within the confines of the money system and money supply, you will find yourself under attack from the inflation games of the Federal Reserve. How do you beat this game? Don’t play it. Hold onto something real that you can control, and beyond the reach of the Federal Reserve. When Hyperinflation occurs, a currency holds no value and loses buying power. When a currency becomes valueless and people can no longer afford to buy things, people seek out a useful & tradeable real asset. Thank you! We touch on inflation a lot throughout our posts and websites. For example, you can read a little on how you can invest in coins to survive hyperinflation. If you want to get a lot of great detail, I’d recommend the website http://www.shadowstats.com/.